The new hutch made it into the dining room. 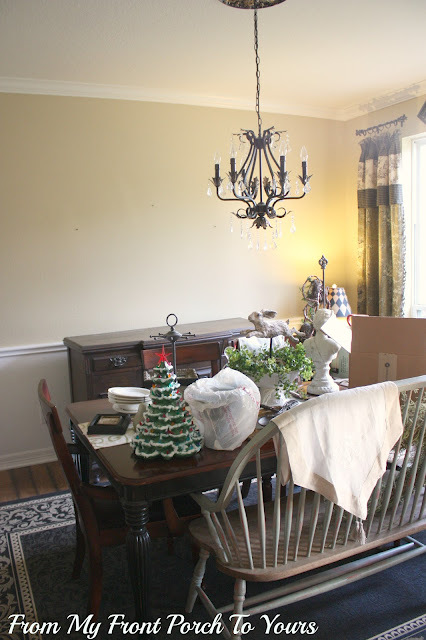 Before I share what it looks like now I thought I would share what the dining room looked liked before I started changing it up. This was one of my favorite rooms in our house. It was actually one that was pretty much complete. Then I found the hutch and all that changed. Here is the dining room with the newly painted hutch. 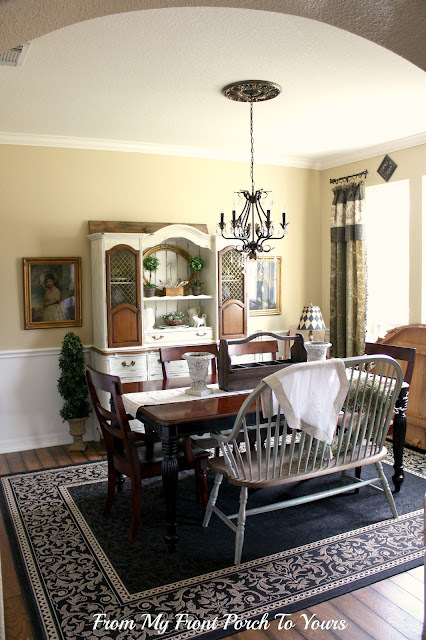 Though I LOVE my hutch I just was not sure how I liked it in the dining room. I would walk by this room a million times a day in the past week just staring at it. I am a creature of habit so sometimes change is hard for me. I honestly wasn't sure if the hutch was staying or if I was going to be selling it. I decided that it needed something on the sides to anchor it to the room. So I decided to take my vintage pictures down from this wall. I really enjoy having a lamp on in here at night so now I am on the hunt for a small table I can sit the lamp on or maybe even get a new lamp. I am thinking I may even change the chair out with another one in the house. I replaced the vintage pictures with this huge frame I purchased out at the cottage before it closed. I love all the detail it has. I am thinking I am going to make it into a huge chalk board once I get a chance. I have always loved Courtney's (French Country Cottage) chalk board in her dining room. Of course mine is not as big but I think it will be lovely once it is done. Thanx for coming by to visit! I can't wait to share more of this space as I find the new pieces to finish pulling it all together. Oh, I think your hutch looks gorgeous in there-and perfect with the pics on either side of it! I love big frames, and yours is fantastic! I think it really brings the whole things together. It has that look like it's always been there. And your bench makes me go crazy every time I see it! If I don't get one like that one day... I don't know what I'll do! But I need one! Your hutch looks great! It makes such a nice statement on that wall. I think you've started something! Yes, one thing leads to another, leads to another, etc.! The hutch looks amazing, and the pictures are just right to finish off that wall. Great work! one thing definitely always leads to another! Next thing you know you'll be wanting to change the curtains, wall color, etc too ;) I really love that hutch! It will be nice to decorate for the holidays. Good luck to your boys back to school tomorrow! Your hutch looks great there and the photos help anchor it just like you thought. I liked the other sidebaord too, but it is nice that this one is taller than the table and chairs for some variety. LOVE that hutch, it's perfect in there and I think the portraits help ground that huge wall. you're right, there's always a domino effect, but that's the fun of it all! Of course you have to keep the hutch. It's the best thing in the room. I'd say keep it and get rid of other things if you don't like them together. I featured your hutch on Mod Mix Monday! It looks great in your room, and I do like how the prints look next to it. I have that same frame, and made a chalk board out of mine (yours might not be as big as mine...can't tell by the pic). I don't think that I will have my party this week, heading down to my condo tomorrow to get it all ready for Isaac. That is a beautiful looking hutch Pamela! Of course anything you do is beautiful, so I know you will make it all come together. Looks great with the vintage photos side by side too. You have great taste girl! I was in love with the hutch before you moved it to the dining room. But now I am head over heels. It all is just the right fit together. Your dining room looks great, Pam (Can we call you that? ), and I love the way the pictures flank the hutch. Very lovely! Oh Pamela.. luved it in the reveal, luv it in the dining room. Superb!! Yes, I am also one for anchoring with large pictures :-) have the same set up in my dining room. Hutch flanked by 2 red poppy paintings I did. I knew it would look fabulous, I love the chalkboard idea. I can't wait to see the end result. 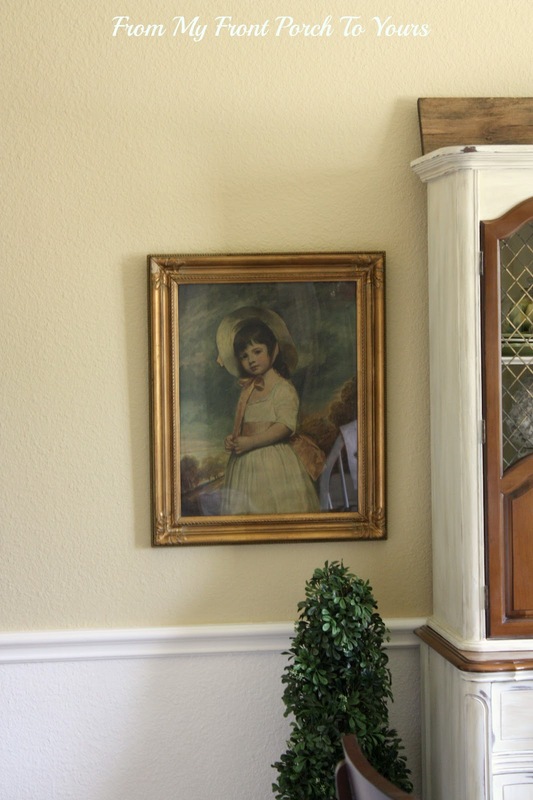 You know i fell in love with this hutch and I think it look lovely in your Dining Room. The whole room is very charming!! It looks fantastic, Pamela! The hutch was meant to be in there ... and, I love how you flanked your fabulous prints on either side! Gorgeous! Oh, Pamela! It is gorgeous! It looks beautiful in your dinning room! I love the pictures on each side! Very, very pretty! Looking good, Pamela. Glad you were able to keep the hutch. The hutch is beautiful and I like the changes in your room. Very balanced - looks like it's always been there! I will have to send you a picture sometime of our current dining room. It has a mirror very similar to the one in your room. Such a huge difference with the hutch. It looks great in the room, Pamela! Plus, you've got some room on top to add some decor, too. I like the pictures on either side and the topiary you added in, too. That mirror would make a great chalkboard. Love the hutch it looks great in its new place. Your dining room is just stunning!! I absolutely love the portraits and big mirror. I like the before and after photos. Your wood floors are so pretty. 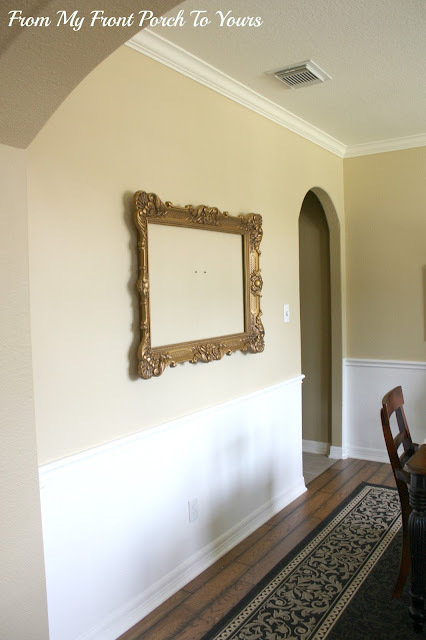 your dining room is so classically beautiful! 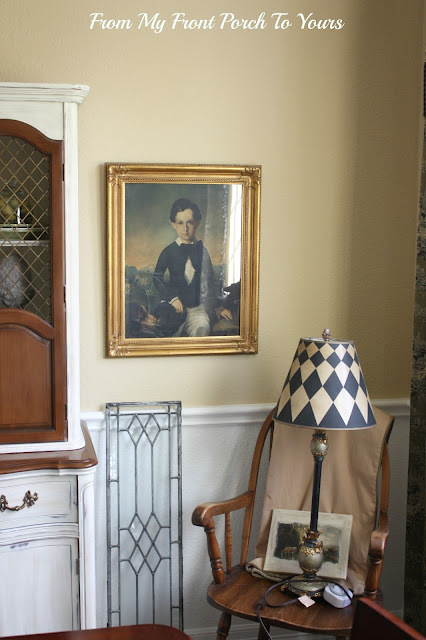 love the china cabinet as well as the gold mirror. The addition of the vintage pictures looks really good! Wow. Pam this hutch made all the difference in your dining room. So does the white bench. I can't wait to see the chalk board. Well it does look great! The pictures really did the trick! I like your chandelier- I'll have to check out the one you mentioned at Courtney's. I love your curtains. I need something new in my living room. I really like the look of yours! It's amazing what a little moving around can do to a room! the pictures look much better beside the hutch, which i love by the way.